Parkinson's disease, Huntington's disease, cystic fibrosis and many other fatal human diseases are hereditary. Many cancers and cardiovascular diseases are also caused by genetic defects. Gene therapy is a promising possibility for the treatment of these diseases. With the help of genetically modified viruses, DNA is introduced into cells in order to repair or replace defective genes. 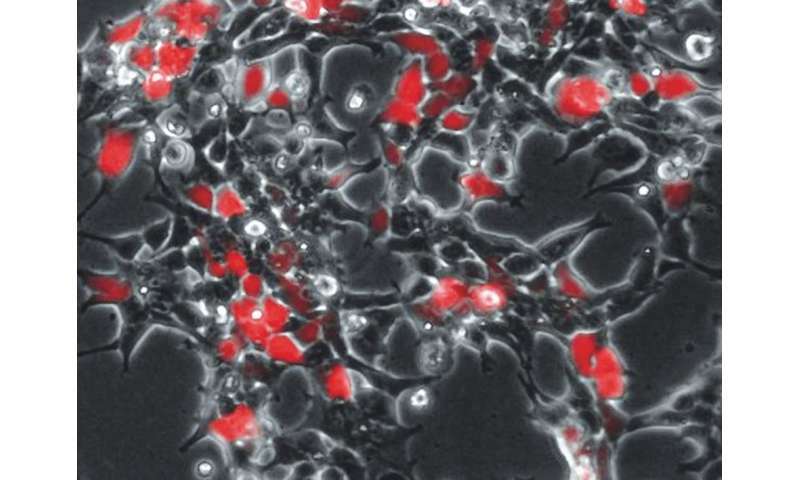 Via this method, scientists from the German Primate Center (DPZ) - Leibniz Institute for Primate Research have discovered a quicker and more efficient treatment for the cells. The scientists changed the so-called HEK293 cell line that is used for the production of therapeutic viruses. The cells then produced a protein called CD9 in large quantities. In addition, they modified the viruses for gene transfer in such a way that CD9 is integrated into their envelope membrane. These genetic manipulations resulted in a faster and more efficient infection of the target cells. The resulting higher transfer rate of DNA into the target cells promises new and improved gene therapy treatment. The study was published in the journal Molecular Therapy. The ability of viruses to introduce their genetic material into the host cells is used as a tool in gene therapy. These "gene taxis" consist of modified viruses, the so-called viral vectors. They are equipped with fully functional genes to replace the defective disease-causing genes in the cells. However, the prerequisite is that the viruses recognize and infect the corresponding cells. "In our study, we wanted to find out if it was possible to improve the infection rate of viral vectors and how," says Jens Gruber, head of the junior research group and senior author of the study. "At the moment, the infection rates, depending on the target cells, are often around 20 percent, which is not enough for certain therapies." To change that, the researchers looked at the production of the so-called exosomes to find out how to use this mechanism in order for the virus vectors to become more efficient. Exosomes are small membrane vesicles filled with proteins, RNA or other molecules. They are used for the transportation of cell components and for intercellular communication. "Our hypothesis was that we could improve the production of viruses and their efficiency by boosting exosome production in the cells," explains Gruber regarding the relevance of the transport vesicles for the study. In order to produce large quantities of the CD9 protein, Gruber and his team genetically engineered the HEK293 cell lines used for the production of viral vectors. This protein is known for its function in cell movement, cell-cell contact, and membrane fusion. The assumption was that it could also play a role in exosome production. 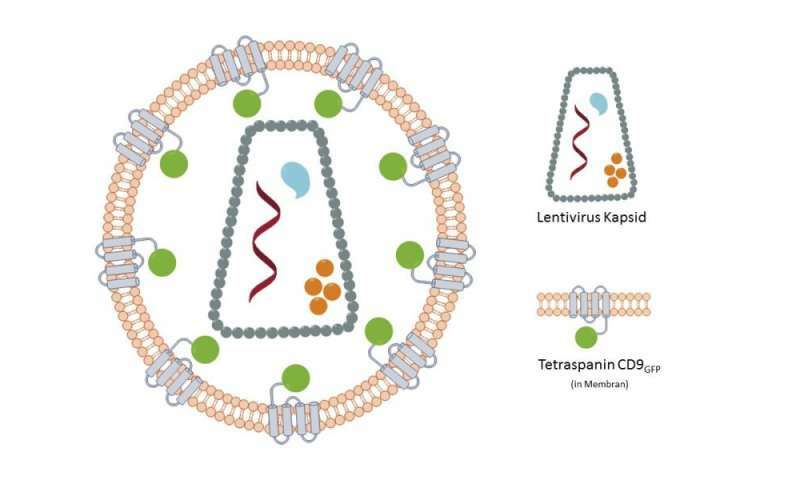 In addition, the scientists incorporated the CD9 protein into the envelope membrane of viral vectors. "We were able to observe two things," Gruber says. "First, in comparison to the untreated HEK293 cells, exosome production in the HEK293-CD9 cells increased significantly, which suggests a crucial role of the protein in exosome formation. Second, the incorporation of the CD9 protein in the viral membrane has significantly improved the transfer of DNA. This was observed in an increased number of infected target cells that carried the desired gene without the implementation of additional virus vectors." The increased amount of CD9 in the virus resulted in a higher infection rate of approximately 80 percent. The protein appears to have a direct impact on exosome production and virus efficiency, which has previously not been described. "The results of our study provide us with a better understanding of exosome formation as well as virus production in cells," says Gruber. "These findings can be used to make currently used virus-based gene therapies more efficient. In future, we might be able to completely abstain from using viruses and only use exosomes to transport genetic material into target cells."